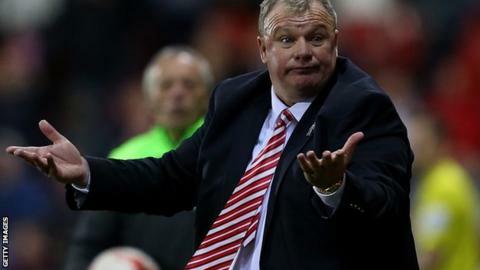 Rotherham United manager Steve Evans says his team's Championship survival was inspired by a Millwall player claiming the Millers lacked guts. They beat Reading 2-1 on Tuesday to ensure their survival and relegate Millwall and Wigan instead. "A Millwall player said we've not got bottle. I've got 12 bottles of pink finest Champagne and we'll be drinking them for about a week," said Evans. "Look forward to League One, son, and keep your trap shut." Millwall striker Lee Gregory had told the This Is Local London website he hoped Rotherham would lose against Reading and then "bottle it" in their final match at Leeds United. Rotherham, who gained successive promotions in 2012-13 and 2013-14, were deducted three points last week for fielding an ineligible player, but have retained their Championship place after taking eight points from their last five matches. They also condemned Wigan, who won the FA Cup in 2013, to League One following their second relegation in three seasons. The Latics will be joined in the third tier by Millwall, whose five-year stay in the Championship was also ended by Rotherham's home victory. Goals from Matt Derbyshire and Lee Frecklington were enough to beat Reading. "It's my best ever result as a manager, ever. The pressure has been intense; there's not been a lot of sleep. There's been heartache," Evans, 52, told BBC Radio Sheffield. "When you get points taken away from you it's a bombshell but we had to show resolve and character and we have done that. "We have got over the line and they can take our points but they will never take our fighting spirit and passion to stay in the division. "I have won a lot of promotions and been at Wembley and won the play-offs, I think, individually, this was the biggest result."